Mark Zambarda was born in New York City in 1985. 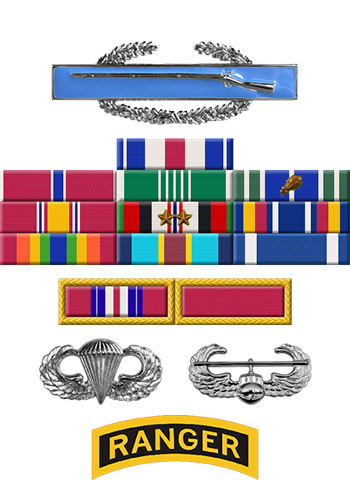 He entered the U.S. Military Academy at West Point on June 30, 2003, and was commissioned a 2d Lt of Infantry in the U.S. Army on May 26, 2007, having completed Air Assault School in 2005. Lt Zambarda attended the Basic Officer Leader Course at Fort Sill, Oklahoma, from June to October 2007, followed by the Infantry Basic Officer Leader Course at Fort Benning, Georgia, from October 2007 to January 2008. He then completed U.S. Army Ranger School in May 2008, and Airborne School in June 2008, both at Fort Benning. His first assignment was as a Platoon Leader with Company A, 2nd Battalion of the 12th Infantry Regiment at Fort Carson, Colorado, from August 2008 to June 2009, and then deployed with his unit to Afghanistan from June 2009 to June 2010. After returning to the United States, CPT Zambarda served as an assistant planner with the Operations Cell for the 2nd Battalion of the 12th Infantry Regiment at Fort Carson from July 2010 until he was retired from the U.S. Army on June 26, 2012. During this time he was responsible for planning the battalion operations, deploying them to the Joint Readiness Training Center at Fort Polk, Louisiana, in November 2011, and to Afghanistan beginning in March 2012. Mark is married to the former Heather Di Silvio, and he is currently in Law School at U.C. Berkeley School of Law. For gallantry in action on 15 July 2009, while assigned as Platoon Leader, 3rd Platoon, Alpha Company, 2nd Battalion, 12th Infantry Regiment. 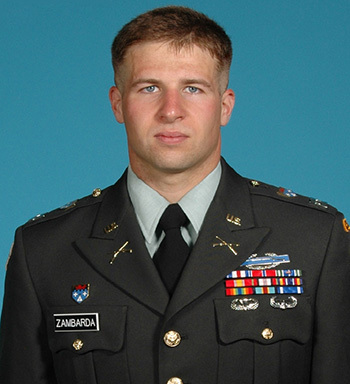 1LT Zambarda's mental toughness, courage, and selflessness enabled his platoon to escape an enemy ambush without losing a soldier. His action contributed to his platoon's mission accomplishment in capturing high value targets and in securing them off the objective. His actions are in keeping with the finest traditions of military service and reflect distinct credit upon himself, the lethal warriors of 4th Infantry Brigade Combat Team, 82d Airborne Division, and the United States Army.